The Nike Vomero 12, Brooks Ghost 9, and adidas Supernova are well cushioned neutral daily trainers and share near identical weights around 10.7 oz/303 g and heel to toe drops of 10-12 mm. Obviously they are competitors! We'll attempt to sort out the subtle differences between them. Basic Stats-courtesy Running Warehouse where you will find all the models in this article here. adidas Supernova if you want the softest, widest on the ground ride, especially upfront, some Boost bounce and a snug narrow upper, especially at mid foot. Nike Vomero 12 if you want a blend of the other two and the smoothest road feel with a mid foot toe spring, and the stiffest flex forward of that with, an overall snugger foot hold than the Ghost, but a very comfortable one. I was skeptical as I found the Ghost 8 (review here) a bit of a stiff, lumbering and not much fun. Not the same story with the Ghost 9! While not a light shoe it is lively on the road and transitions smartly due to its segmented crash pad designed and we think effectively so to "accommodate any landing and deliver smooth transitions" also having the extensive re sculpting of the medial side wall from a vertical "stability/pronation" profile to a more curved, easier transitioning profile. While it is clearly heavier, noticeably so by 1.4 oz, it would be a toss up for me with the Launch 4 as to which has the better ride, especially at slower paces. The Ghost 9 (left below) has considerably smaller lugs with deeper and more segmentation especially in the forefoot and heel. The result is a far more agile, flexible and smoother transition to toe off than in the Ghost 8 (right below). While of course super cushioned, as the others are, there is more road feel, more of a sense of the foot in motion over the ground here than with Vomero and Supernova. The upper is now a soft yet supportive engineered mesh. It seems like many, many late 2016 and 2017 shoes are going with the soft engineered mesh "held up" and structured up front with a rubber toe bumper. While the bumper is fairly firm the overhead room is spacious. The Ghost 9 toe bumper and mesh front is particularly effective with plenty of width and toe height room, no hot spots or pressure points. So effective and very unusual for me as I often can size up a half, that my true to size 8.5 is almost to roomy up front on my medium to narrow feet and more spacious than the other two in this article. Wider,high volume feet will find a comfortable home in the Ghost 9! The rest of the upper is supportive without being as tightly snug as the Supernova but not quite as elegantly smooth holding all over as the Vomero with its Flywire providing the support over soft mesh at mid foot. 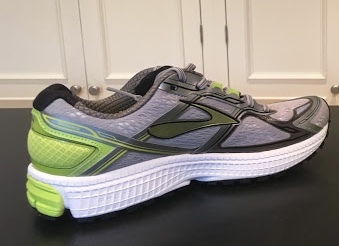 The midsole is Brooks BioMoGo DNA, nothing unusual but when combined with the Caterpillar Crash Pad design and the many pods has me thinking yes, it's like many caterpillar legs feeling their way along the ground. It feels like at every part of a stride I have distinct sensory impressions and feel even with all the plush cushioning. The outsole has 2 densities of rubber HPR Plus for the high wear areas and Blown Rubber up front with an added row and is substantial. Likely the Ghost will have the longest wearing outsole of the three but miles will tell. No one will mistake the Ghost for an up tempo shoe but of the three it is the most fun to run. Decently agile and with a longer, softer and smoother flex than the Vomero, not as soft overall as the Supernova, and especially so in the forefoot where the Supernova's Boost Stretch Web outsole dampens feel and response and Vomero is hampered by a single flex point with a stiffer front flex Ghost has the best road feel and smoothest overall transition of the three for me at varied paces. My last Vomero was many editions ago, maybe number 3 and it got me through the St George Marathon with its 13 miles of steep downhill and to a Boston qualifier. The Vomero 12 is Nike's entry in the cushioned daily trainer sweepstakes and is a fine shoe. With exception of somewhat of a sharp taper right at the toe and the high front bumper it has the best upper of the group for my medium to narrow foot. It fits me true to size, The Flywire supports without constraining, if with a bit of snugness under the arch and while the engineered mesh is not quite as soft up front as the Ghost it does a fine job overall. I would say it is the most breathable of the three. The midsole has two Nike Air Zoom units one at the heel and one in the forefoot embedded in Lunar core foam and then surrounded with firmer Cushlon carrier foam. The heel landing is very stable and cushioned, less mushy than Supernova but a touch softer than Ghost. 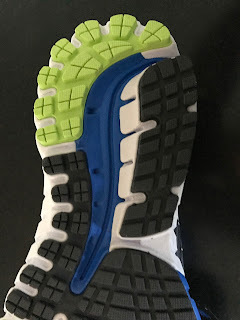 The forefoot is very cushioned and responsive and is the best "feeling" of the three but... the flex, likely due to the forward air unit, is far back at the second lace loop and when combined that forward of that the shoe is stiff thus impeding toe off transition somewhat for me especially as the pace picks up. It just doesn't quite have the agility or ground feel of the Ghost, despite its silky smoothness overwise but is certainly is more agile while stiffer than the very soft Supernova. The outsole is mainly Nike's white and soft Dura-DS rubber with a small area of BRS 1000 Carbon Rubber at the heel. The Vomero's main flex point is at the 3d groove so far back of normal especially if the front of the shoe is stiff as it is here. Overall this approach reminds me of many trail shoe flex patterns where the rock plate, in this case the Zoom Air provides protection. To try to help increase forefoot flexibility a series of X's are carved through the outsole, an after design adjustment? I say more flex at the front and a longer flex please to make Vomero oustanding. While the cushion, stability, and response is just as I like it the Vomero ride is somewhat deadened and overly vanilla smooth and up front as the flex point is far back, and as stated above, relatively stiff forward of that. The Vomero lacks transition to toe off pizazz at speed for me. 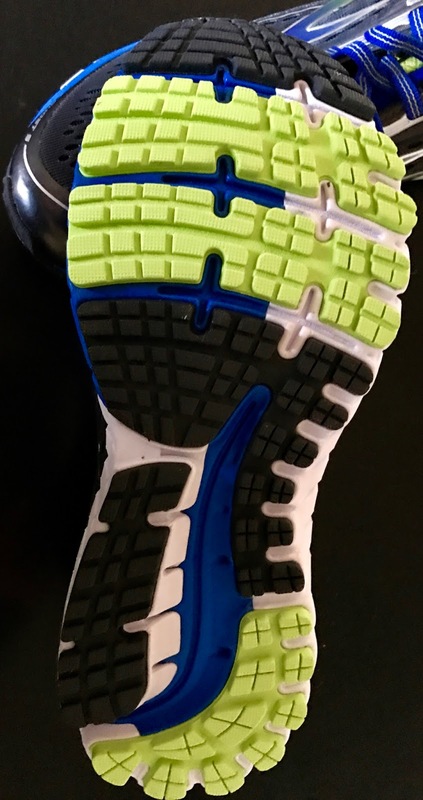 What I feel in lack of pizzaz may not all be about flexibility...It is interesting as I like the ride of the incredibly stiff, very firm but well cushioned All Out Flyknit (review here) with its higher pressure Zoom Air unit better. Could it be the combination of lower pressure in the Vomero front Zoom Air unit, soft front outsole, and lack of any firmer outsole stabilizing elements at mid foot all elements the All Out has that give the All Out its comparatively snappy yet unusual ride? We previously reviewed the Supernova here also comparing it to the Ultra Boost and Energy Boost. The Supernova is the most and softest cushioned of the three with a very wide heel footprint on the road. It also has the snuggest upper. Those would wider feet could easily size up a half size. It shares the more minimal Torsion System of embedded plastic with the Ultra Boost along with a Stretch Web outsole. These last 2 combine for a soft and somewhat more ponderous ride than the others in this article or the Energy Boost from adidas (see our recent adidas trainer comparison article here). As there is very little and soft, but none the less durable Continental rubber up front, the outsole compresses into the bouncy Boost midsole for a soft ground conforming and in my view somewhat mushy toe off and this despite the firm lime green EVA layer just under foot. The toe box mesh in contrast is soft and well ventilated and a touch less pointy at the very front than the Vomero, likely due to the smaller narrower rubber front bumper and slightly softer mesh. The front of the shoe fit is excellent if narrow. It's what's under foot the Stretch Web outsole over Boost, and this despite a layer of Adiprene EVA directly under foot, which makes the shoe somewhat ponderous and even seemingly heavier than its almost identical at least listed weight to the other two, at 10.6 oz size 9. My size 8.5 weighs 10.6 oz so listed weights may be "optimistic" although during manufacturing some variations can occur. The Supernova is for those who want great cushion, a sink your toes into firm sand feeling up front and a very supportive narrower upper. It is a shoe for slow easy miles in great comfort with a welcome Boost bounce. I wish the Supernova had the excellent lugged style outsole and full mid foot Torsion System of the adios Boost and Boston and Energy Boost. All three of these are among my favorite shoes of the last 5 years with a snappy toe spring and full use of Boost's best properties of energy return. The Supernova sits closer to the even softer and lighter Ultra Boost which has no EVA layer at all. This was a tough article to write as the three shoes are so close in stats, purpose, and even ride. All of these shoes here could lighten up in weight. Generally I train in somewhat lighter shoes in the 9-10 oz range such as the Launch 4, Ride, and Boston 6. The uppers with the exception of the Vomero are in my view overbuilt. If you are looking for a very well cushioned slower miles daily trainer you won't go wrong with any of them but fit is key, especially if you have a higher volume wider foot. The Supernova and Vomero both have relatively narrow snug fits; the Ghost 9 is roomier all around. In terms of smooth cushioned ride at slower speeds, upper support and comfort including breathability the Vomero is my pick. In terms of performance, ride, and road feel I would lean towards the Ghost 9 and at $20 less than the Vomero and $10 less than the Supernova it is a good value with plenty of durable road rubber. Sam is the Editor and Founder of Road Trail Run. He has been running for 45 years with a marathon PR of 2:28. All that time he has been a run shoe geek starting with wear testing some of the earliest Nikes when he was in high school. These days he runs 30-40 miles per week in New Hampshire and on trails in Park City, UT. He has an annual goal of breaking 1:40 for a half and occasionally qualifying for Boston as he goes into a new age group. Sam is also the contributing writer for wearable fitness tech and music for Competitor Magazine. 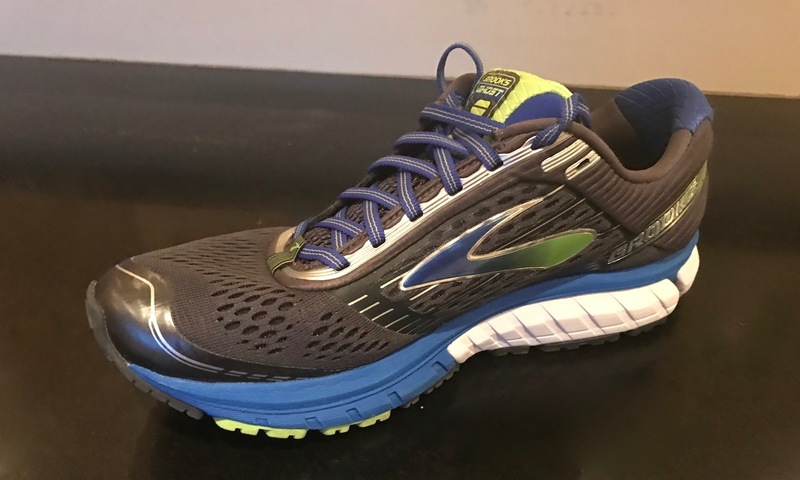 The shoes reviewed in this article were provided at no charge by Brooks and Running Warehouse. The opinions herein are entirely the author's. Great review Sam! I'm wondering what you thought the biggest differences between the launch 4 and the ghost 9 were (esp for longer-ish runs). if the rides are similar is there any advantage to the ghost 9 over the launch 4 (esp. as the launch 4 is lighter and probably more agile I assume)? Love the reviews and the site! You can also follow Road Trail Run on Facebook, Instagram, and Twitter. Hi sam! I'm interested to buy nike vomero 12 as my new training shoes and probably gonna be my marathon shoes. After several reviews(including awesome review from you! ), I wonder about the flexibility of the shoes. It seem every review mentioned about the shoes flex at wrong place. So is that means the shoes will cramps my leg during longer distance training? Hi! Im wondering how the saucony ride 9 would compare to the Supernova? And also if its a big difference between the ride 9 and the upcoming 10 when it comes to cushioning and fit (know the 10 is not out yet but im curious)? I will need to replace my Glide 7 soon and both the Supernova and Ride is on my radar. But I dont really like when the cushioning is too soft, like the ultra boost or Asics cumulus for example. Therefore Im leaning more to the Ride. I also have quite narrow feet and the Ride 7 as well as the previous Glide boosts have fit me well. Hi Sam! Thanks for your answer. I tried the Ride 9 on in my local store the other day. Seems like Im a bit between two sizes. Either too short or a bit too sloppy. The Ride 7 fit was better. Will maybe try the Supernova instead or give my hope to the upcoming Energy Boost. Adidas seems to be the brand with the best fit for me of the shoes that Ive tried. With the NB zante as an exception, but i want a bit more cushioning than that for my daily miles. Thanks again for your answer and for a great website. HI Carl, Did you also try the Energy Boost? Livelier shoe closer to Ride in performance. Hi Sam,I had the first version of the Energy Boost which is one of my all time favourites. However I didnt like the 3rd version that much. Feels a bit heavier than the first version and the upper with the plastic cage is not as good. Hard to find the right tightness around the foot. Havent seen any pictures of the 4th version yet but hopefully that will be a bit more like the first version. I compared the Vomero 12 and the saucony iso 3. It seems you rated the vomero 12 slightly higher. I found the saucony a little more responsive. I am a heel runner, when running up hill I found the saucony more responsive where as the vomero tended to sap the energy because the heal is so soft. The other thing I found is the cushioning on the saucony seem to be a liitle better in shock absorbing. I have a slight bulging disc and seem to be slightly less jarring. I did like the vomero for its softness and comfort but I think the saucony is slightly better especially for response, saving energy up hills and comfort for back and knee issues. I did try the adidias Ultra st, so comfortable but I felt the medial thing stick into the heal of the foot, and my right foot seem too loose on the heal. Your thoughts on the vomero 12 vs saucony triumph iso 3? No more Nikes for me. I have worn Vomero's for 10 years and love em but am looking at competitors. Thanks for your article. Crush the country haters through peaceful protest of their protest of our country. No more Nikes for me and millions of others due to their outrageous support of Kapernik and defamation of our Flag and National Anthem. Please read and weep Nike and corporate sponsors. I hope your sales tank for this outrageous support of this defamation of our country. Take your legitimate protest and do it somewhere or sometime else - but not during our national anthem of which we all(US citizens) should come together as one for national unity!